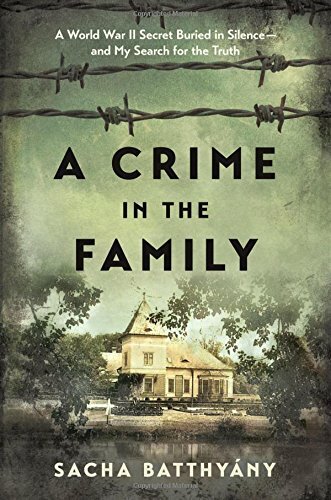 A Crime in the Family by Sacha Batthyany is touted as a story of this author’s search for an event that occurred at the end of World War II and involved his great aunt, Countess Margit Batthyany. Specifically, during a party at her mansion, a group of drunken Nazi officers left the party, went into town, and assassinated 180 local Jews. While there is mention of this event, it is only a passing mention through the 224 pages. The focus of the book is directed more at a secondary event: the brutal execution of two Jews, a husband and wife, and Batthyany’s search for answers to the questions of what happened to the children of this couple, and the deeper questions of how these events came about; how his parents dealt with, or did not deal with the family shame; and how he, personally, was affected as he dug into the bowels of his family history. The story is a combination of nonfiction and creative nonfiction, as he fashions nonexistent diaries of what those involved might have thought or said or written. He creates fictional meetings between fictional Nazi soldiers and his own grandfather. Betthyany experiences deep feelings about why this couple was murdered while members of his own family stood by and did nothing, and the resulting incarceration of the couple’s children in a concentration camp. Throughout the book he shares his visits with a psychoanalyst, where he discusses his feelings about the people involved, as well as his steps to learn more. To say this is a convoluted story would be an understatement. In a discussion with his psychoanalyst, he covers all the ground: “Yes, that’s right. The crime story. First Rechnitz, the diary, the Mandls, then Agnes, Mirta, all those stories flowing into each other.” The crime story he refers to is first the execution of the 180 Jews at Rechnitz; then a family diary; then the death of the Jewish couple (Mandls); then their daughter, Agnes in the concentration camp; then his communications with her daughter, Mirta; and finally the revelations to Strassberg, his psychoanalyst. Convoluted, indeed. If the reader is looking for a tale about drunken Nazis executing 180 Jews at the end of the war and burying their bodies in yet to be discovered graves, this is not the story to read. Although Batthyany comes to terms with his search, he follows a long, hard road to get there.